What Problems Does This Vacuum Siever Solve? Agglomeration, which results from the tendency of small particles to stick together, forming clumps. Static cling, or the cumulative effect of static charges on many small particles. This also results in the particles forming clumps. Blinding of sieve openings caused by particles on the margin getting stuck in the openings. The CSC-Reynolds Vacuum Siever overcomes these problems and delivers repeatable results for separations as small as 20μm. The vacuum siever does this by producing a vertical air jet applied to the bottom of the sieve using a rotating arm. This lifts the particles off the sieve surface to free oversized particles caught in the mesh and break up clumps. 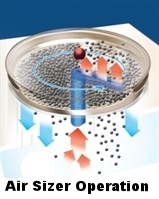 At the same time, a vacuum pulls the free particles down through the sieve. The vacuum is supplied by a standard vacuum cleaner. A standard "ShopVac" is supplied with the CSC-Reynolds Vacuum Siever. *All sieves, except CSC Brand sieves, require damping o-ring for proper operation of instrument. 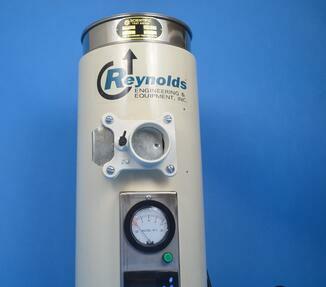 When Do You Select the CSC-Reynolds Vacuum Siever? This Vacuum Siever was developed by Reynolds Engineering & Equipment, Inc. for their customers who used grinding equipment. These customers needed an economical and efficient way to check the accuracy of their grinding equipment in the small particle range. In the lower ranges of sieve test capabilities - particles down to 20 μm. For small particles that tend to clump or agglomerate. With material that cause you problems with blinding. The CSC-Reynolds Vacuum Siever provides an economical way to deal with these problems. It gives a range of adjustment for the vacuum part of the process and the ability to automatically time your tests. In conclusion, if your separation needs are basic and your issue involves small particles, agglomeration or blinding, this instrument may be the particle distribution analysis solution.